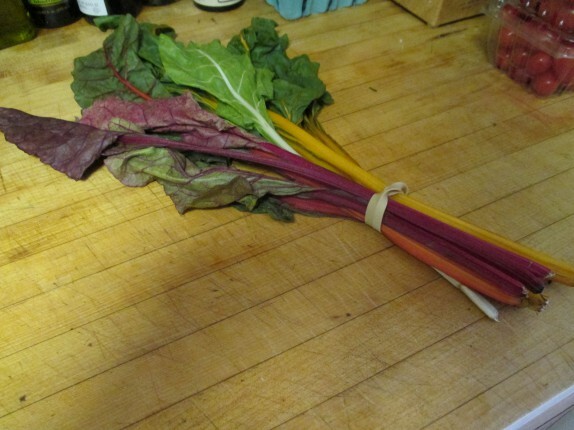 A co-worker who subscribed to a weekly CSA was looking for a home for some rainbow chard she wasn’t going to use. I enthusiastically requested it, because my wheels were spinning in full force once I saw it. 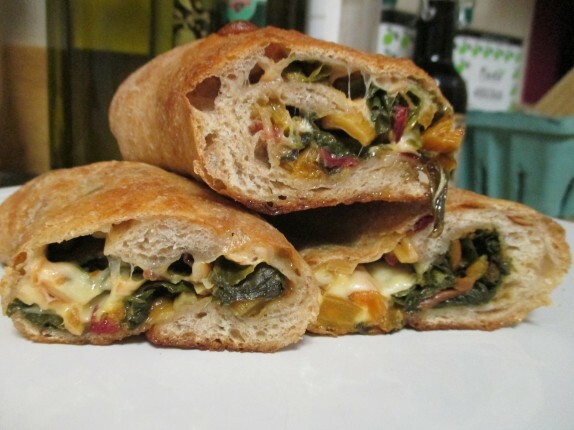 In the store, we used to make stuffed breads, kind of like stromboli, and one of the variations we made contained sauteed spinach and provolove cheese. Back in the day, I didn’t eat greens like I do now, so I never tried it. 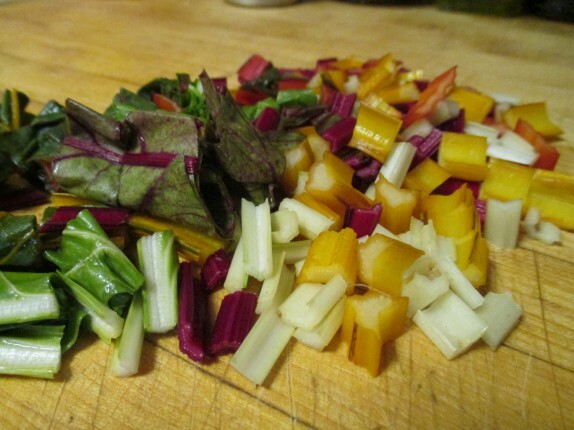 For some reason, the only thing I wanted to do with this chard was saute it and stuff it into some dough with some provolone cheese. There’s really two stages to doing this. 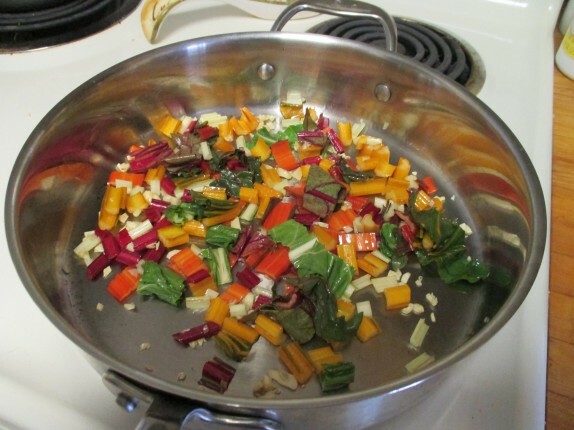 First, you need to saute the chard (or any leafy green that you’d cook – i.e. 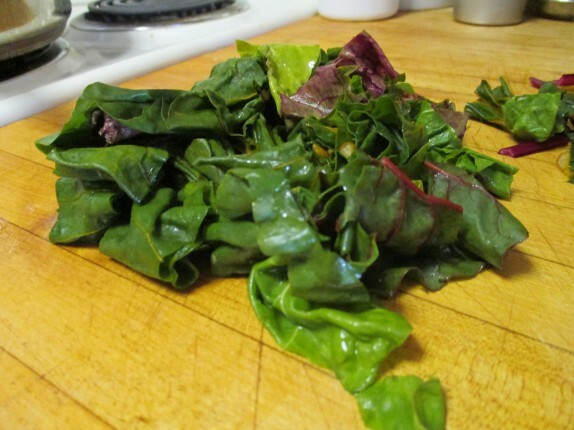 spinach, kale, mustard greens, Swiss chard.). For mine, I simply heated a heavy pan with a couple of tablespoons of olive oil, toasted off some chopped garlic, then sauteed the chopped stalks over medium heat. 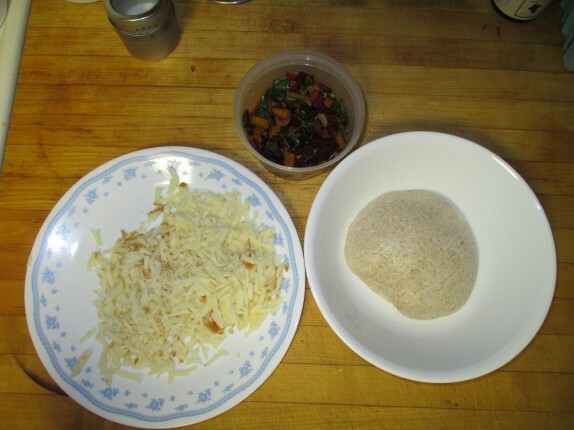 I crushed in some dried pequin and dundicut chiles, took a step back (because chiles + oil = noxious smoke), and added about half a cup of water (you can use chicken or vegetable stock, too.). When all of the liquid was gone, I added the chopped leaves and tossed it all together off the heat with some salt and pepper. At this point, the leaves were bright green and slightly wilted. 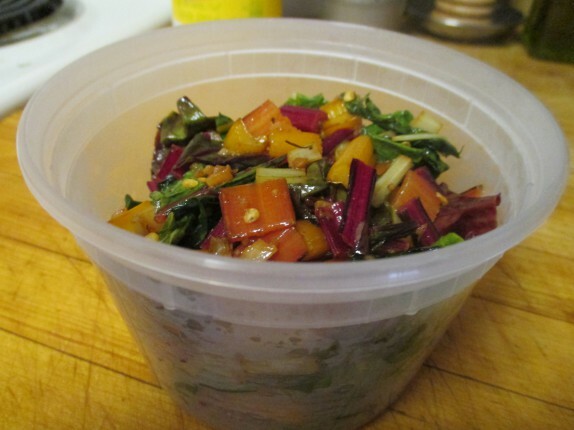 I transferred this to my finest left over Chinese take out container, and let it cool. 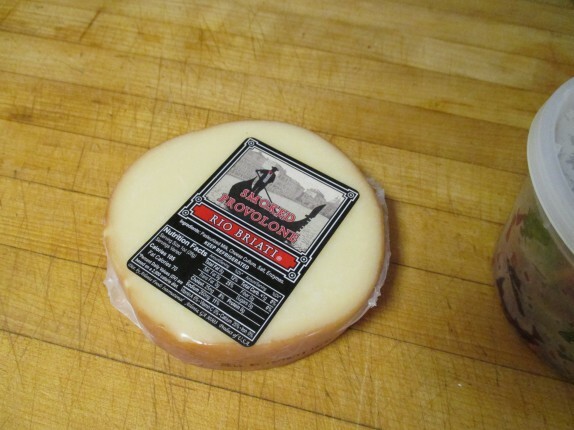 In the meantime, I scoped the cheeses at my local super market, and found a smoked provolone. 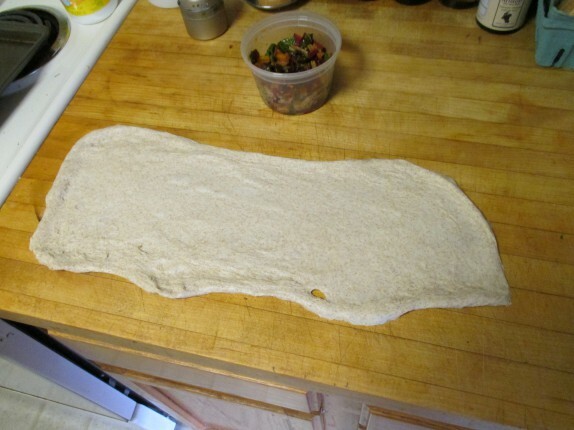 A few feet away, I found a stack of whole wheat pizza doughs (you want to use your homemade stuff, do it). I split the dough in half (and froze the remaining half), shredded the cheese (sliced works too, and probably better, but it would have been dangerous to slice this cheese into rounds with a knife the way the cheese was formed), and let everything come to room temperature when I was ready to assemble. I started the oven at 400°F. 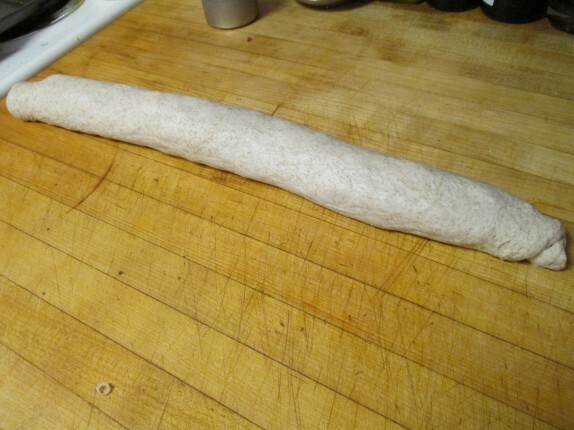 …and roll the whole thing away from me until the seam faced down. Then I transferred it (carefully, seam down) to a lightly oiled baking sheet, poked some holes on top with a knife (for steam to escape), and drizzled it with some olive oil. This baked for about 25 minutes. I let it cool a painstaking 25 minutes. This is actually an important step because the cheese is far too amorphous right after removal from the oven; resting the bread roll lets the cheese harden a little. Plus, you don’t burn your mouth when you bite into it, which is an added bonus for waiting a few minutes. The way I had everything, I liked the amount of filling in the bread. I do enjoy more bread whan filling, though. The beauty of this is that you can add as little or as much filling as you want, within reason. 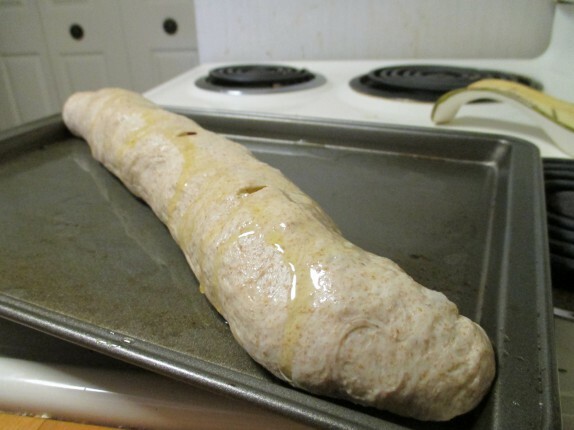 If you roll too much into it, it’ll fall apart when it bakes. Chard is a fairly bitter vegetable, but that dulls out a little when you saute it. The chiles I added brought a lot of heat to this, probably too much for most, but I like it. 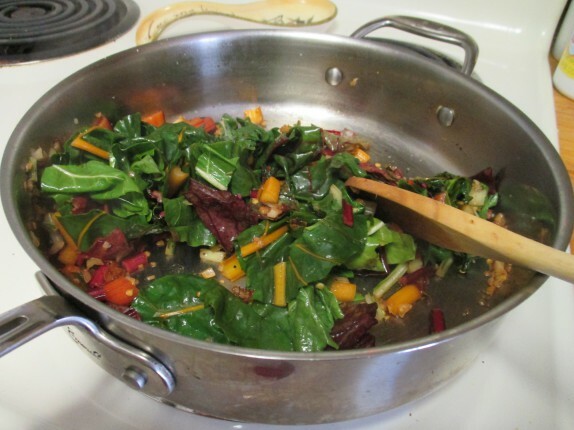 I always like to saute in some chile when I cook greens. 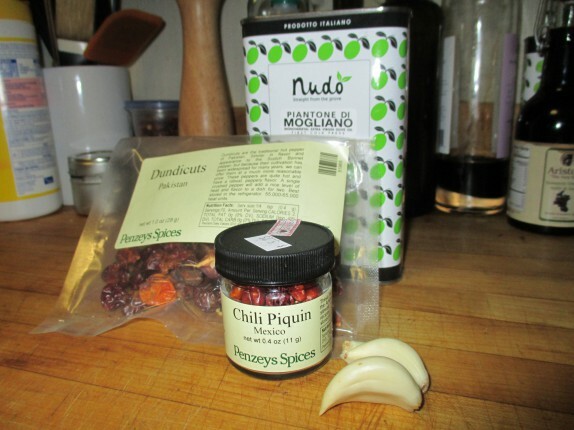 I’m accustomed to using fresh chiles, so I was a little out of my element with the dried stuff. Luckily, the two types of chiles I used had their own flavors that added to everything. The cheese cut the heat a lot, and the aroma of the smoked provolone permeated every bite, even bites that didn’t have any cheese (which happens when you make a roll like this. As you can probably tell, the sky is the limit with this type of prep. 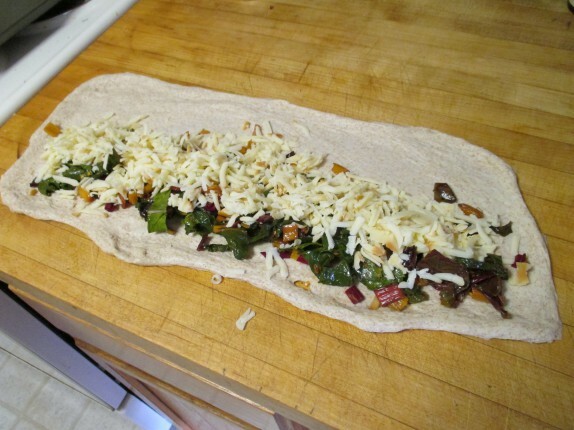 As I said, you can vary the greens, and you can vary the cheese. You can also stuff some puff pastry or filo dough like this and make something a little more flaky and delicate. 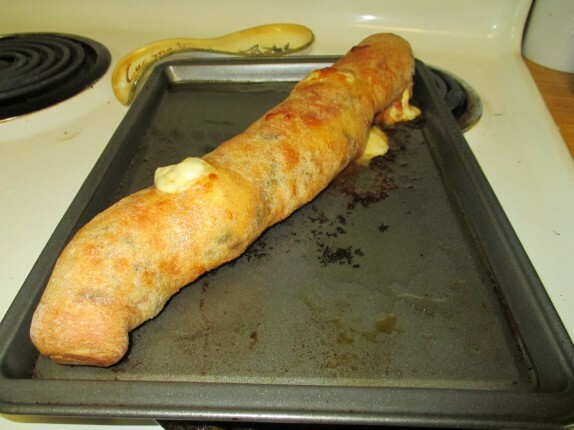 What a great recipe and instructional pictures…it looks even better than what I remember…that might be, yes it is, the best looking stuffed bread I’ve seen. I’m going to put your derryX.com in my column for Saturday and get you some more fans! 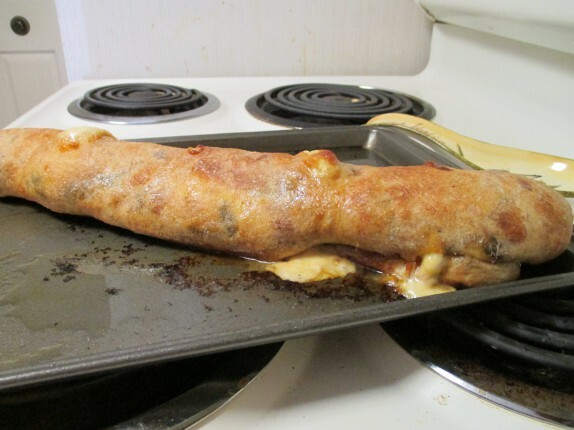 Oh man I *love* stromboli. Might have to make it this weekend. Yummmmm! !